Thirty minutes east of Zion National Park, this town is right in the midst of the mountainous natural beauty of Southwest Utah. Residents can play on four golf courses, shop in the historic downtown, or attend a softball game at the Canyons Complex. Employment opportunities at places like Intermountain Health Care and the SkyWest Airlines headquarters keep the city's economy moving. While the city is becoming more diverse, Mormons still make up about 65% of the population. --B.D. 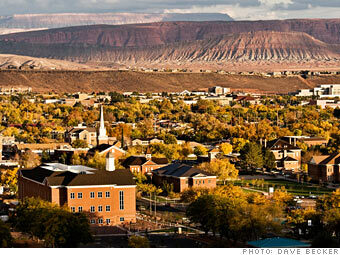 Is St. George a great town, or what? Tax credits are equal to 6% of federal standard/itemized deductions (without state taxes paid) and 75% of Federal personal exemption amounts. The credit amount is phased out above $12,000 in income ($24,000 for joint returns).